The Customer Complaint Policy is a policy for use with your employees and contractors for how to deal with customer complaints. This policy is used to set your standards and rules for dealing with problem customers. This Customer Complaint Policy is included in editable Word format that can be customized in Word or by using the included Wizard software. How do you write a Customer Complaint Policy document? We value our customers and respect their opinions. If you are not working in Customer Service, please refer the customer to Customer Service. If the complaint is via phone, give the customer the appropriate Customer Service number, and then offer to forward the call. If you are working in Customer Service, listen and respond respectfully to the customer, whether via phone or in person, and thank the customer for reporting the issue. Log the complaint into our system via the established form. Make sure you get all the details. Discuss the options you are authorized to offer for fixing the problem. If you cannot resolve the problem immediately, explain to the customer that you will resolve the issue as quickly as possible and get back to them. Then refer the complaint to the party who can resolve it. Make sure that you or the party to whom you passed the complaint calls the customer in a timely manner (within 48 hours) to offer an apology or a voucher for a free product or service. Ask if the customer is satisfied and record the result in our tracking system. 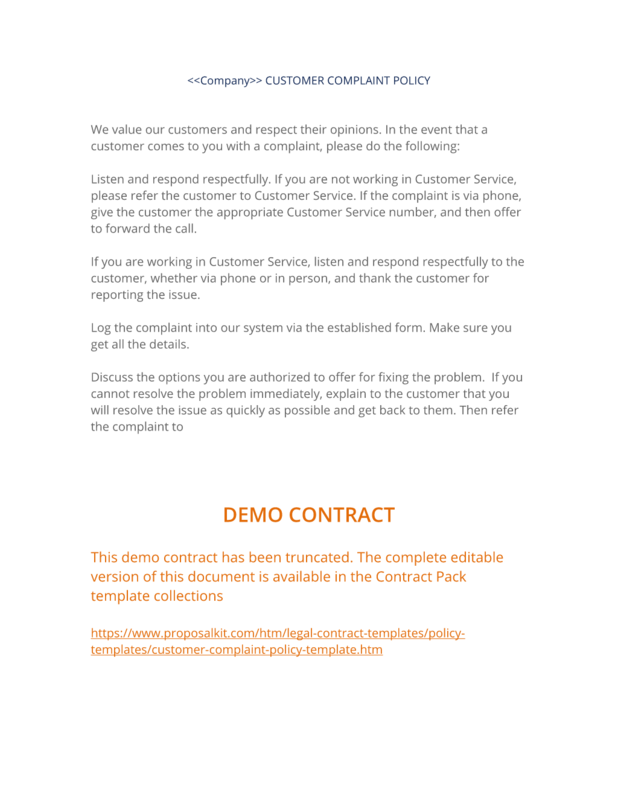 The complete Customer Complaint Policy - with the actual formatting and layout - is available in this Contract Pack.